Today, there are about 75 million people worldwide who call themselves 'Methodist'. Yet this Christian denomination only began in the mid-eighteenth century in Britain, due in large part to the strong leadership, extensive travelling and organisational abilities of John Wesley, celebrated today as the most prominent 'Founder of Methodism'. 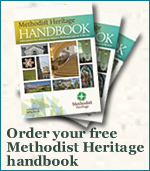 Methodism has around 100 historic sites for you to discover in Britain. Perhaps surprisingly, these fascinating places are not all churches - although the Methodist Church in Britain does have over 500 'listed' chapels. The Methodist heritage sites range from Georgian houses to workers' cottages, from lovingly restored and unique eighteenth and nineteenth century chapels to unusual outdoor preaching places. But who was this John Wesley? John was born in 1703, the fifteenth child and second son of the Reverend Samuel Wesley, Anglican Rector of Epworth in Lincolnshire, and his wife, Susanna (née Annesley). In 1709, aged 5, John was rescued from a fire that destroyed the family's home, but the Epworth Rectory was rebuilt and the Wesleys lived there until 1735. Today their Queen Anne house is presented to recreate family life in the eighteenth century, and the grounds include glebe (grazing) land and a 'physic garden' of medicinal plants and culinary herbs. John was educated at the Charterhouse School in London and at Oxford University. He was ordained as an Anglican deacon (1725) and priest (1728) at Christ Church Cathedral, and became a tutor and Fellow of Lincoln College. He joined like-minded friends in the so-called 'Holy Club', whose disciplined piety attracted the mocking nickname 'Methodist', later transferred to all adherents of the Evangelical Revival. After more than a decade of spiritual searching, including a disastrous period of missionary work in America with his younger brother, Charles, in May 1738 John had a spiritual experience that convinced him of the truth of his salvation through faith in Jesus Christ. He began to preach that this salvation was available to everyone. In 1739 a fellow member of the Holy Club turned Methodist preacher, George Whitefield, invited John to start open air preaching in Bristol (at Hanham Mount). There John built the very first Methodist building, which he called 'our new room': a purpose-built space for preaching, teaching, as a medical dispensary and as lodging for his rapidly expanding band of travelling preachers. Nearby is Charles Wesley's home. Charles was also a member of the Holy Club, who became an Anglican priest and later, after also experiencing an evangelical conversion, became an influential Methodist preacher and prolific hymn-writer. Charles' best-known works include the words that became the carol, 'Hark! The Herald-angels sing'. John Wesley is estimated to have travelled 250,000 miles in 50 years to preach the gospel. He started his work in London in 1739 in an old cannon factory, known as 'The Foundry', but he built a new London chapel in 1778, adding a house on the site for his visiting preachers and another for himself. 'City Road' became his winter base. He died there in March 1791 and was buried behind the chapel. John Wesley may be the best-known of the Methodist pioneers, but he was not the first or only one. The earliest 'Methodist' preaching in Britain was in the 1730s in Wales (consider the ministry of Howell Harris). Methodism was part of an international movement, often traced to the 'Pietists' in Germany in the 1600s, which came to Britain through the Moravians - who John Wesley had met on his ill-fated visit to America (see Fetter Lane Chapel and the Moravian Church). 'Methodist' became a widely used term in the 1700s for anybody thought to be 'enthusiastic' about their religion - as we might use the term 'fundamentalist' today. A major divide developed among the Methodists between the 'Calvinists' and 'Arminians'. Calvinism tends to stress the power and authority of God over who can be saved, while Arminianism emphasizes the capacity of each person to choose to respond to God freely and the opportunity for all to be saved. The Wesleys and their followers embraced Arminianism, but Whitefield was a Calvinist, and even today much of Welsh Methodism remains 'Calvinistic'. Despite John Wesley's claim 'I live and die a member of the Church of England', by the time of his death the Methodist movement (which, by then, was largely associated with John Wesley) had grown apart from the national church. Methodists in America had already parted from the British 'connexion' (see Asbury's Cottage) and from the 1790s onwards Methodism in Britain divided over policies, personalities and priorities. Each strand of Methodism had its own charismatic leaders and particular styles of worship and organisation. The first breakaway group from the 'Wesleyans' was the 'New Connexion' (see the stunning Methodist New Connexion Chapel and monumental graveyard of Mt Zion, Ogden near Halifax, or Bethesda Chapel, Hanley, known as 'The cathedral of the Potteries'). Next, and the biggest group to establish separately, were the Primitive Methodists, from 1807. Known also as the 'Ranters' or 'Prims', they wanted to get back to Methodism's original aims of outdoor evangelism and strict discipleship. They tended to be strongest in the working-class communities of the Midlands and North of England. To find out more, visit the Primitive Methodist Chapel and Museum at Englesea Brook near Crewe, Cheshire, and nearby Mow Cop. Methodism has had other regional variations, and Irish Methodism has always been separate from British. Wesley enjoyed particular success in preaching in the mining districts of Cornwall, and in the South-West the 'Bible Christians' separated from the Wesleyans after 1815. Step back in time to the secluded Bible Christian Innis Chapel, near Bodmin, Cornwall. Methodism grew with the Industrial Revolution and Methodists were active in the abolition of the slave trade, and later in the development of trades unions - visit Tolpuddle in Dorset to find out more. Thomas Coke was born in Brecon, Wales, and expelled from his Anglican pulpit of South Petherton for being a Methodist. He went on to co-found Methodism in America and then to establish the Methodist missions overseas, which in the nineteenth century spread around the world. Many of our historic Methodist chapels have memorials that commemorate their famous sons and daughters in the mission field, for example, David Hill from York went to China. In the twentieth century most of the different Methodist denominations united together. The New Connexion, Bible Christians and United Methodist Free Churches (another breakaway following a major controversy in the Wesleyan church from 1849) came together in 1907, forming the United Methodist Church. That in turn joined with the Wesleyans and 'Prims' in 1932. The uniting conference was held at Central Hall, Westminster, where in 1946 the inaugural session of the United Nations was held). Union also brought together the denominations' separate missionary societies. Today the British Connexional Team occupy 'Mission House' built in 1939 in Marylebone, London, to house the Methodist Missionary Society.